A new sofa came to live at StoneGable this week. It’s almost embarrassing to say that in the last 3 years we’ve gotten 4 new sofas! One for the living room, one for our sitting room, one was a prize for being Lamps Plus Blog Of The Year and this one. Three are slipcovered and one has a very tough wearing natural fabric. I’ve learned a whole lot about buying sofas over the years… mostly learning by my mistakes. Here are a few good-to-know tips when you are looking for a sofa! I’m pretty partial to the Pottery Barn “COMFORT” sofa. This is NOT a sponsored post. It’s just what I like! We have 2 at StoneGable and my kids all have the Comfort sofa too. We replaced a really great sofa in the family room because it “sat low” and I am tall with long legs and knee problems. I could not sit and get up comfortably. Being comfortable is so important! So the original family room sofa is going into my daughter’s family room. 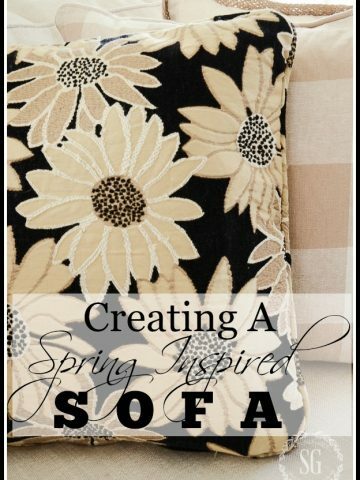 Since I have been buying so many sofas lately I thought I’d share what I learned with you! For years, I bought big hunkin’ sofas and tried to cram them into the space in my room. I thought it was important to get the most seating. I was forgetting we also needed to move around our room easily without bumping into the sofa. Live and… oh yes, learn! Sofas vary in size. Make sure you buy one that fits you room! Take into consideration the arm length, seat depth, back height and overall dimensions of a sofa! We downsized our sofa by 6 inches and the new sofa fit the room a whole lot better! You can get a sofa for $300.00 or $30,000.00! You really get what you pay for in a sofa! Now that I have said that… you don’t need to buy the very best. Let me explain. Twenty seven years ago I bought 2 sofas that cost $6,000.00 a piece. And that was 27 years ago!!! I was young and have no idea what I was thinking. It took us years to save for them!!!! I did get them on sale… even so, they were still very very expensive. They were gorgeous for the day and NEVER wore out. BUT… I wanted to get rid of them after 7 years. I was tired of them and the styles changed. Because I had spent so much money for them I kept them for 23 years!!!! 23 years with 18 century yellow floral brushed cotton sofas. Oh, yea! I will never do that again! I want to get about 7 years out of a sofa and use it hard. So, I now will pay for 7 years worth of sofa that will hold up for about 7 years. This was a hard lesson to learn! And one I so happily pass on to you! One other thing. Buy on sale. Sofas are big investments. We got our sofa during an annual sofa sale for 30 % off! SCORE! Kiln dried woods like oak will guarantee a sturdy sofa. A sturdy sofa is a very good thing. Your sofa is your most used piece of furniture! There are also springs and slings and 8 way ties… but your eyes will glaze over if we go into all that! Just know that if you buy from a reputable company they will be able to tell you all that. Buy the most solid sofa you can afford for how long you would like it to last! Do you want a modern sofa? How about traditional? Rolled arms or box? Skirt or none? Box cushions, knife cushions, attached or loose? There are hundreds of styles and types of sofas. That’s good news for you, the consumer! Do a little sofa perusing on the web to find your perfect style! My sofa has rolled arms and boy do they make a comfy place to rest my head! There are several different materials sofa’s are filled with. Let’s talk about the most popular types. Polyurethane is a low cost and easy to care for filling, but it has a tendency to flatten over the years. High resiliency (HR) filling is a little harder, but wears better. Goose down is luxurious, but clumps. My best advice it to go with a HR wrapped in down. The best of both! Be smart and sharp when choosing sofa fabric and pattern! Unless your sofa will only get very light use, stick to durable fabrics that clean up easily! A sofa with an easy-to-clean tough fabric is a sofa you can love… and it will love you back by giving you years of easy care and great looks! Give slipcovers a try. They are very popular right now and no wonder! I can throw these slipcovers in the washer and dryer. I chose a “performance” fabric in ivory from Pottery Barn and I can completely dry these slipcovers before putting them on my sofa frame. Most slipcovers need to be stretched and put on damp. 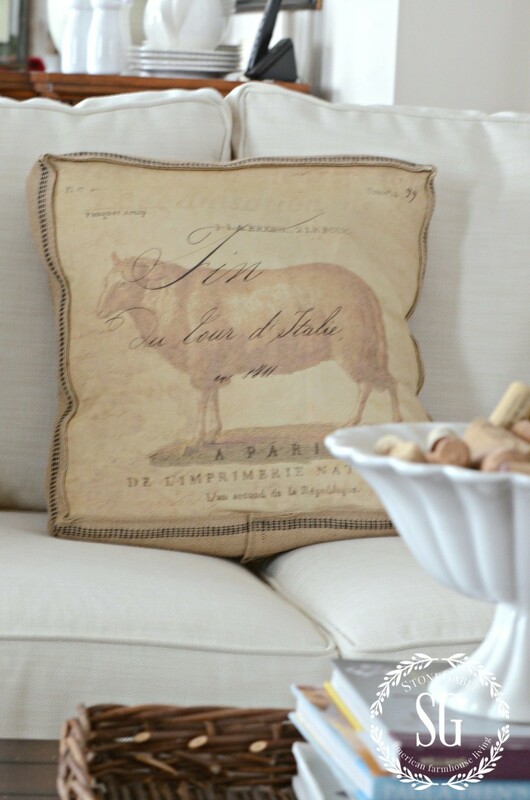 Another great thing about this fabric is that stains can be blotted up… and this sofa is ivory! Just another reason to love it! Choose a fabric you love and works with the rest of the room. Most custom made sofas are not returnable! 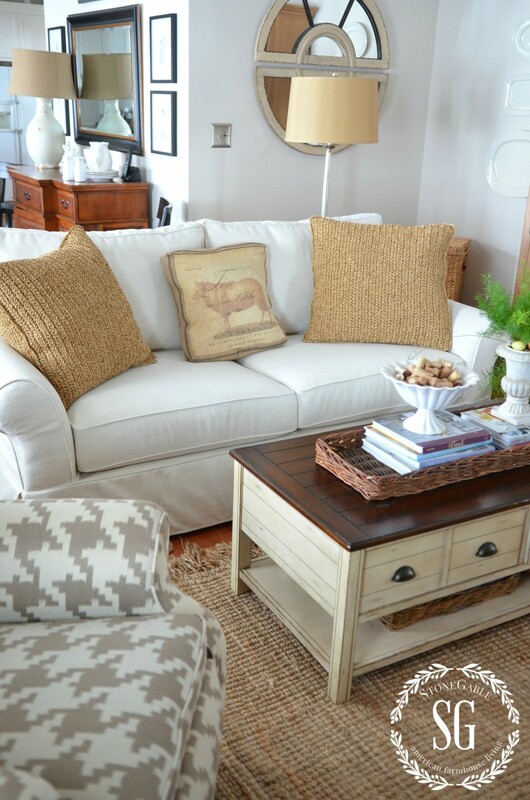 SG Tip: Here’s the formula… durable fabric + easy to clean + great color and/or pattern= a wonderful sofa. Know your warranty. Keep it in a safe place and don’t forget where you put it! Read the delivery fine print. Some furniture will be brought in and set up for you… some leave it at the curb. My sweet daughter just had a bathroom vanity delivered yesterday in a downpour and it was left at the curb. And no hubby around! Lesson learned! I hope this helps you have a well informed and fun sofa shopping opportunity! Go… Look… Conquer! Please leave a comment and tell us your best sofa buying tip!!!! Remember to pin this to your DECOR or HOME or TIPS AND TRICKS Pinterest boards. You can follow me on Pinterest and see all my home and garden pins HERE. Rosanna, I am trying to decide on sofa size for our family room at our vacation beach home. It is fairly small measuring 14 ft wide and 12 ft, 4 inches long. The back wall has a fireplace in the center with built in cabinets on either side of the fireplace with a small square window above each built in cabinet so no furniture can go on that wall. The wall on right has a triple window and the wall on left has wide plank bead board from chair rail height to floor. The entrance to room is open to a walkway to back door and the dinning room. I tried a sectional against wall with triple window and the other side in the open entrance area but it made the room closed off with a small entrance into the room. I want to open up the room by using 2 sofas facing on the 2 side walls. My husband wants a very long sofa to increase seating in the room. We split up the sectional sofa to see how how 2 sofas facing each other would look in the room and the long part of the sectional sofa is 99″ and it is on wall with triple window. We still have room for a narrow end table without going into natural walkway to back door. My biggest concern is that the sofas will overpower the room. I was thinking of using the PB comfort slipcover grand sofas with rolled arms at 90″ long (2 seat cushions). I would put sofas on each wall because moving them off wall would leave dead space behind sofas. I want 18″ on either side of coffee table for people to walk and I might leave entrance area open without any furniture or maybe 2 stools or 2 arm-less chairs or one comfortable chair. It is a difficult room to furnish and we have 6 adults in our family with our grown children. What are your thoughts about this room? Thank you for your great tips on purchasing a sofa. Sounds like you could use a StoneGable Interior consult, Janet! Hi! My family recently bought a couch from Resteration Hardware. The couch is covered in a perennials textured linen weave. The couch cushions and pillow are incredibly wrinkled. Would buying larger/firmer cushion help? Or can a household steamer be used? We are having trouble deciding on a sectional for our family room. We loved two – one at pottery barn and one at Raymour & Flanagan. The one at Raymour was a lot bigger. We have a large family room. We were wondering if we should go with the bigger one at Raymour or get smaller one at pottery barn. I just don’t want to over worry about spills etc with pottery barn furniture …..Thinking of saving pottery barn furniture for our formal living room. Decisions, decisions! Hi Rosanna, I really can’t properly answer this question unless I have the dimensions of your room, furniture etc. It’s all about proportion and utility and comfort. Wish I could do more for you. i am planning to buy a sofa but was really confused regarding the comfort of sofas for my family. thank you for the blog, i loved reading it. I would love to know who you bought a sofa from that last 20+ years and give them my business. Pottery Barn isn’t exactly cheap, but they make them in the USA . The downside is that there is ZERO warranty on their sofas. After 30 days, you’re out of luck. That is nutz to me. Even the cheap places like Jennifer Convertibles offered a lifetime frame warranty. I know! Try Ethan Allen. That’s where I got my 20+ year old sofa! Loved your blog! I’m trying to decide an ivory fabric for a PB comfort couch and yours in the pictures looks exactly like what i want. Can you please tell me if this is the performance everyday linen ivory or the sunbrella basketweaven in ivory? Thanks! I’m not an expert in Pottery Barn Colors. My best advice, Halima is to order samples and go from there. Hope this helps. Would love to hear what you decide. Hi Yvonne – I love this blog post; so helpful. We purchased a 2-piece L-shaped Pearson PB couch in Performance Suede – Oatmeal 7 years ago just after our first son was born. At the time we lived in a small, CA bungalo with the intention of staying there for years. The couch was perfect as our living room was half the house and bathed in sunshine all day long. But, as it often does, life happens and four short years later, we moved into a lovely, old Colonial in Connecticut that doesn’t get a lot of light. Though our living room is really large – 16ft x 21ft, the windows/porch doors are all stacked at one end of the room and the remainder of the room houses a large fireplace and lots of wide-open doorways to the dining room and hallway. There are no walls to pushed the L-shaped corner into at all (for reference, we had trouble finding a wall space wide enough for an upright piano – there is exactly one wall on our main floor wide enough) The couch feels gargantuan and we don’t have the funds for a new one at this time. For the past 3 years we’ve styled the couch as two separate pieces – but the large piece continues to overwhelm the space. We love the couch; it’s served us well and this far into the game with pets and two boys, we are not looking to get a new couch as they’ll likely destroy it anyway. We’ve talked about getting a slipcover in a lighter color the help the space feel lighter but a new slip cover at PB is $2000 and I might as well get the right sized couch for that amount. Any advice? Nadia, you have lots of questions and I would need to see pictures to really give you a great answer. Can you email me: stonegable333@gmail.com. Let’s try to solve your dilemma! I’m so happy I found your blog! You have fabulous taste and great advice. At the risk of asking a stupid question, what does a slipcovered sofa look like under the slipcover? Is it upholstered or does it look like a pillow without a case? Second question, what is the value of getting the PB Comfort over the Basic? Hi Colleen, great questions. A slipcover sofa is covered. It depends on where you get a slipcovered sofa as far as what it is covered in. Many times they are covered in a white cotton fabric. The Comfort Sofa is just that… more comfortable and has more choices of fabric. Hi! Love the blog! Very useful info, especially this couch post. Under point #3, you said you wouldn’t bore us with details of the construction of a couch, but I was hoping you could share a bit!! I have a bad back and absolutely cannot tolerate soft/poor quality furniture. Can you make recommendations for a firm couch (that will stay firm), or what to look for regarding the construction? Other than PB, and Restoration, where else do you think sells good construction/firm couches? Please advise and thanks in advance! Hi Jill, I like a firm sofa too. My best advice is to go to a brick and mortar store and check them out. Sit on them and test them. I LOVE Smith Brother sofas. They are firm. Hi Beth, I lived some of my childhood just south of Edinburg and love Scotland! The wall color is Sonnett by Benjamin Moore. So i bought a beautiful sectional that includes a corner cuddle chase. The problem is that I can not flip the cushion over due to the shape not matching the other cushion. Something to think about for next time. Thanks for sharing this Nina! I had a couch made that has a cuddle corner chase. You cant flip the cushion because the other side is a regular standard cushion. Somwthing to consider when biting!? Lots of shopkeepers or online store owners cheat us. they sell us low quality furniture by telling that it is with best quality. the buyer who have less knowledge that which things are necessary to be cared about, always get loss.The six tips which you have provided are really very useful to buy a best sofa. I invested in the Pottery Barn Comfort Sofa and loveseat about 4 years ago. The 6 weeks wait for delivery was long, and when they delivered (at a $160 per sofa delivery charge), I was given the loveseat slipcover and a chair slipcover. I was very upset and calls yielded a very unconcerned couple of reps who really didn’t care. I waited an additional 3 weeks for the correct cover to arrive and they would only reimburse me half the delivery charge! I’ve only washed the slipcovers twice but both have torn above the arms. No kids live in our home. I am very disappointed in our sofa and loveseat and PB’s laxidaisical attitude about customer service. Never again! I’ve not had a problem with mine, but both of my kids had similar problems. What is the name/brand of the coffee table shown and where can you purchase it? I love your living room sofa. I know it is the Pottery Barn Comfort upholstered sofa, and you say the fabric is Flax. Would that be the Washed Grainsack in Flax? I have been considering this fabric, but there are other fabrics in the color Flax, and I would like to get the same fabric your sofa is covered in. Hi Candice, The sofa fabric is a performance fabic in flax. Hi! Thanks for sharing your insight! I am about to purchase this sofa in the same fabric…LOVE ?. I wanted to see how it’s holding up? I love this fabric and have young kids…we will be using it everyday. I am worried since it’s a basket weave fabric it will pill or fuzz up over time like a sofa we had earlier in our life…I would gratelt appreciate your feedback! Love your blog, really enjoy your posts. Thanks for tips. Contemplating on getting a new sofa. We too, are in the market for a new sofa, so both the podcast and this blog post are very helpful. Thank you too, to all the readers and listeners that wrote in their responses. All are so helpful and I learned a lot from reading their comments,experiences, as well. We purchased our sofa set from Ethan Allen 37 years ago, and it is still holding up well! When we sell or give it to another family, it will still be comfortable. It has a wood frame and six cushions. I bought it in a quilted pattern, red, white, and blue mostly. We’ve covered it over the years using quilts and blankets. Crazy how long it has lasted! My husband still loves the large sofa! I am looking for a neutral color and I think I will go with Ethan Allen after 37 years of great performance their sofas have given us! I am a little leery of Pottery Barn after reading all of the replies above. We also, do not have a Pottery Barn store in our area. How is your Performance fabric holding up? Any problems with pilling at this point? I was all ‘gung-ho” on ordering the performance tweed and have read online in the past few days of the amount of people that have posted all of their problems with pilling. I would just go with the denim white, but it is not offered if you want down blend cushions. My sofa has no problems and we use it hard. It does have performance fabric. Both of my grown children have PB sofas that are not performance and their sofas pilled. They got replacements and those pilled too! Umm just saw this reply. Just the info. I needed. Thx ?? Thanks for these pre-buying tips, they were helpful. The family room is an even more casual space. “This is truly a family room — everyone in the family uses it equally,” Umansky says. To keep things comfortable, light and playful, the team chose USM storage in a vibrant orange. It adds a ton of storage for books, games and toys, and also infuses the room with color. I am also interested in the PB Comfort sofa, and I was just looking in their store yesterday! One sofa I wondered about is the ikea Ektorp. I know the dimensions of it are a little shorter and it is not as deep, but does anyone have any other comments about that one? Superb designs. Thank you so much for the tips and keep posting such amazing content. I got many ideas from this. We are looking at buying the Restoration Hardware Maxwell Sectional in leather for our family room. I’m having a tough time deciding on the fill – do we go with the Polyfiber Fill wrapped around the 5″ foam core or the Down Fill wrapped around the 4″ foam core? We prefer our cushions to be stiffer, not saggy and of course – long lasting. 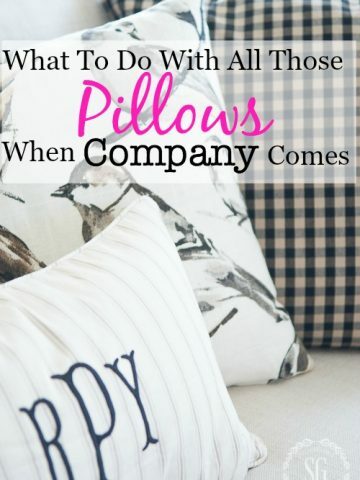 I’m willing to sacrifice a little comfortability and err on the side of too stiff – can always make up for that with a couple of soft throw pillows. Which way should we go? I like that you point out to look for a sofa that will last a long time. It’s understandable that when you go to buy a sofa you are looking for something that will last a long time. My sister is looking into getting new furniture. She will definitely have to keep this in mind when she goes shopping. So, which couch from PB did you like? My husband is also very tall and most couches come with too short of depth for his legs. ira been a while since I’ve looked at their products but will have to again. Does anyone have any experience with the PB tufted sofa (Chesterfield)? We are between the premium performance basketweave in oatmeal or light grey. Also entertaining leather. I was leaning towards the sunbrella fabric in pebble but read a comment above that someone had pilling issues with that fabric so I am no longer going with that one. We have 3 small children and 2 dogs. The dogs are not allowed on the sofas but I know they get up there when we are not home. Any advice would be very much appreciated. Hi. I’m very nervous right now because I ordered PB comfort slipcovered in performance everyday linen. It is a blend of linen rayon cotton n poly. A friend of mine JUST told me she had the same material but it pilled. It’s too late for me to change my order. I’m praying this doesn’t happen to me. I love the look of the comfort sofas and this material which I got in oatmeal was the only color that went well in this room. Dear Friends,wow..at our house we embarked on the “sofa replacement” journey in November 2014 and only now (Aug. 2016) we am nearing the end of the journey to replace the sofa. If you can pardon my rambling, I’d like to weigh-in on our process to replace a sofa. I bought 2 sofas in my life (I’m 65) –one 30 years ago for our formal area that’s pristine still, and the other one for the den/”man’s room 25 years ago…both are of finest construction (8-way blah-blah, hardwood doweled frames, etc.) so they would give years of service, but while my taste in fabrics hasn’t changed, if I only knew then what I know now, the den sofa would have been ordered in top-grain, protected leather and we would not be in this almost constant state of limbo like now, with all of the decision making. Our den sofa is a rolled-arm, tight back Lawson, perfect for catnapping or overnight guesting; however, with hubby clocking in at 6’4″, he hasn’t enjoyed the den sofa as much as other shorter persons have and here’s why: Turns out, in addition to measuring the size of the room to make sure it accommodates the size sofa you select, it’s equally important to make sure that the inside measurements — length and sitting depth –are long enough for taller persons to be comfortable. Yep, learned that lesson too late with the La-Z-Boy recliner also. Our sofa decision has been clouded by the good advice we received: EVERYWHERE we checked, the sales people told us that we won’t find the same quality now that was used 25 years ago, unless we go for a very high dollar sofa. So off we skipped down that rabbit hole of comparing virtues and economics of recovering our-still great framed 86″ old sofa in a very serviceable 50,000 double-rub nylon blend fabric at a cost of $2000 that can be spot cleaned with soap and water to a dreamy Hancock & Moore protected leather sofa at $5959— quite the spectrum! ), that will stand up to a good wiping down after spills, kid, pets, guys. There are several other very good quality leather ones scattered in between $3,500 and the $5,959 H&M that are made by other manufacturers (and we were only looking at the ones with the legs integrated into the frame, NOT the screw on legs, mind you). Considering that we’ve been agonizing over something that we hate to keep revisiting in our house and the time spent visiting stores and the phone calls to check out everything with different vendors, etc., we are almost exhausted and just want it over so we can start enjoying a sofa for the next 25 or so years again and not have to deal with it any more. Still, it was so –I want to say–almost offensive a thought to put another old sofa into the landfill, especially one of a very sound frame but worn-out fabric. So in the end, we will be gifting our old 86″well-framed sofa (after recovering it in suitable fabric) to our daughter, and replacing it with the 95″ leather sofa. We bought a new lake home in the fall of 2014 and I wanted nice furniture for the living room since it was the entryway of the house. We decided to splurge and bought a Pottery Barn PB Comfort couch and two swivel chairs in performance tweed fabric. It is important to mention that this is a second home and mainly used on weekends, not on a full time basis. After only 3 or 4 months, the fabric was badly “pilled”. I called Pottery Barn and they told me this was a known issue with this fabric and promptly replaced all of the slipcovers with a performance canvas that “would not pill”. Less than a year after receiving the new slipcovers, they look even worse than the tweed did. AND, the seat cushions on the couch are severely sagging. I called Pottery Barn again to express my disappointment and was told that pilling is normal wear and tear, not a defect and did not address the sagging cushions. Hello! I have just read the conversations about the PB sofas, and I am so glad to hear so many positive comments including your own! By the way, I’m new here, and already love your site! Thank you! Some readers have good opinions about Pottery Barn sofas and some don’t. My kids sofas did not hold up well and they got new ones from PB. As far as Ikea… I have seen them and sat on them but really don’t know more than that. I noted that you have the pottery barn comfort roll arm sofa in ivory performance fabric and that you had it in linen and basketweave. Which would you recommend to be the best?! And do you have the boxed edge cushions or the knife edge cushions?! Good point on not buying for forever… I have two Pottery Barn leather sofas by Mitchell Gold. They have gotten so squishy they are difficult to get up from and give you backaches. I was reluctant to replace them since I spent so much originally. Live and learn. Time to shop. I am so happy I stumbled upon your blog! I am working with PB on replacing my less than a year old Pearce Sectional in performance tweed because the fabric has piled and balled up and really looks horrible. I love PB and have so many of their other products and I am so impressed that they are standing behind whaat they sell. Anyway after reading all of the comments I just wanted to verify a few things. Can you tell me which performance fabric you have? Have you had it over a year and still love it? The customer service tells me that the performance ultrasuede and velvet hold up the best- just not sure I want that look. Also, you said you had other PB sofas- do you have performance fabric on those? If not, what fabric do you have and are you happy with it? Thinking I may switch to slip covers also. Thanks for your willingness to help me! , but I forget what fabric (not performance) and they both pilled and balled too. My daughter’s sofa was replaced with a performance fabric and my son is still working on getting his replaced. Too bad, I think their down wrapped foam core sofa is fabulous! Hope you can get this issue straightened out. We have the Cindy Crawford couch, love seat, and matching chair and we love them! I have a question though about how you wash your couch… What setting do you use in the washer? I have a hand washing setting, delicate, casual and normal. And also should I let it dry in the dryer on low or extra low or should I put it on wet? Or let them air dry before putting them on? What would you recommend? I’ve been putting off washing them because I’m so scared I’m going to mess them up! Thanks in advance! Hello. I read on the Stonegable blog that you have the Cindy Crawford sofas — the Beachside? If so, do you like them? Comfortable? Holding up? I am really torn between them or the splurge of a Pottery Barn sofa, which I really can’t afford at the present time. Thank you so much in advance for taking the time to let me know about your sofas! Beth. BRITTANY, The best way to wash your sofa is to follow your manufacturer’s recommendation for your specific sofa. This has been such great information. Thank you! I have the PB Comfort as well. They have been in our basement, however, we are moving and will be using the sofa in our new living room. I need to get a new slipcover and am debating which one to get. I have two dogs and two kids. I currently have the twill fabric in neutral. I like them, but they do stretch out a bit and look sloppy. I like the fabric to stay ‘tight’. Are your performance fabrics staying firm on your couch so that they don’t look sloppy? That is why I moved ours to the basement. I was looking at the performance tweed in ecru but also love the look of your linen. Do they wrinkle? I hadn’t thought about the pilling – have you experienced pilling? Sorry for all the questions! Hi Susan, the performance fabric on my sofa stays very tight, and all spills and dirt can be wiped away. I would personally stay away from linen because it looks so pretty until you sit down on it. Then it can be a wrinkled mess. With kids and dogs you might want to go with a more family friendly fabric.Hope this helps Susan. Good luck in your move! Thank you! I love the fabric on your sofa. I see that they are a performance linen. Do those wrinkle? I love your blog! This post has been so helpful! 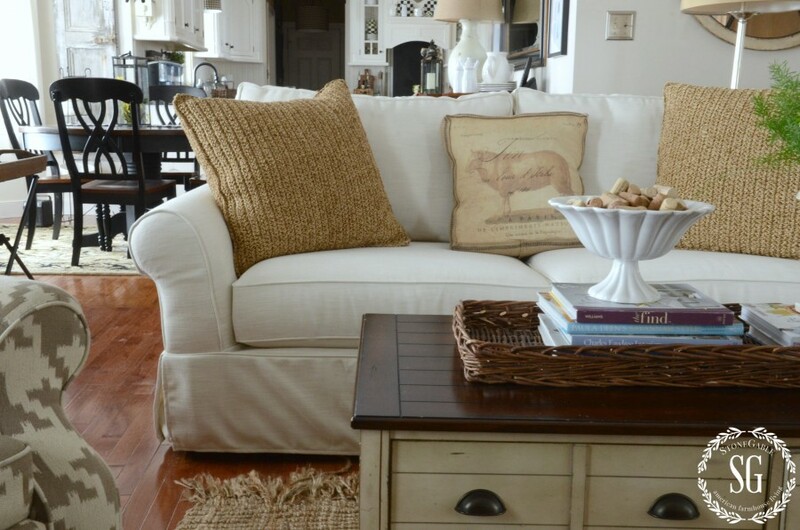 We are looking at purchasing the PB Slipcover Comfort Roll Arm sectional for our cottage. Are you still happy with how your sofa has held up? Also, did they deliver it with the slipcovers on? I love my sofa.Just be careful with the fabric you choose. I went with the Performance fabrics and have been so so pleased! Great points to keep in mind when shopping for a sofa, but you didn’t mention the fabrics. Many fabrics contain chemicals that are outlawed in other products, and given the connection between chemicals in our environment and our increased body burden, it’s important to make sure to use third party certified fabrics (such as Oeko Tex or GOTS). For years my main concern in buying a couch has been how well it would hold up being built into a fort…! My husband and I are want to buy a new sofa for our home, so I’m happy that I found your post! I really liked your tips, especially what you mentioned about looking for a sofa that is well made. Like you said, the sofa is our most used piece of furniture, so we should make sure that it’s going to last a long time! We’re going to go to the furniture store in a week or two, so I’ll make sure that I keep your advice in mind. Thank you for the help! Very good read. I was just wanting to know if you chose the Sunbrella performance in Ivory or the performance linen in ivory. I pretty much want the exact same sofa you have here. Please let me know. Hi Jennifer, I chose the ivory performance in linen and love it! Which of the current PB performance fabrics does yours match? Hi Kim, I have the first Pottery Barn sofa. Ours is not a sleeper sofa. Hope this helps. hi Stonegable, thanks for the reply. My question is about which fabric that is offered now is comparable to what you have?…since PB doesn’t sell “Perennial Performance” anymore. Hi! I just found your blog/ post. I’m not sure if you will see this today, however, I am going to purchase a couple of the PB Carlisle Sofas in the Premium Performance Fabric in Ivory like you have today. I am opting to go with upholstered over the slip cover option though. I have 2 small dogs (that aren’t supposed to get on the sofas although I have to “shoo” them off every now and then) and a 2 yo and a 4yo. Five questions. (1) I know this fabric will clean to new fairly easily, however, with the ivory, are you constantly seeing little smudges or dirty marks? Its reassuring to know I can definitely get it looking new with spot cleaning, but in your opinion, what is the day to day upkeep? (2) I am getting 1 of the sofas with the chaise attached. What are your thoughts on this fabric being “under foot”? And, what are your thoughts on chaises in general? (3) Do you think I’ll be okay with getting this fabric on an upholstered piece as opposed to as a slip cover? Do you think spot cleaning the arms and all will be fine? (4) Do you have any issues with little hairs (I have short haired dogs and a wool rug) getting stuck in the basket weave itself? What about just clinging to the sofa? And (5) Do you notice any piling of this fabric? Thank you so much! This is a huge purchase for us, and I’ve literally looked everywhere for a long term review on this fabric, so any advice would be greatly appreciated. Rachel, great questions! First, welcome to the StoneGable family! Here’s what I can tell you about my sofa that is slipcovered. We have had it for about a year and so far we have been able to spot clean everything off of it… but I don’t have little ones. Are you opposed to slipcovers? I understand that some people just don’t like them. But if you are okay with them make sure to talk to someone at PB about them. They fit as tight as upholstery and can be washed and dried. Then you don’t have to worry about the pets and little ones. I know you will make the best decision. I LOVE my performance fabric. Great choice! Hi Yvonne, Thanks for the tips! They are so helpful since I’m currently shopping for a sofa and specifically a pottery barn sofa. I’m debating between performance Canvas Vs Cotton ones(twill and canvas) since I have a baby that will soon grow up to be a naughty toddler. I would hope to get something that doesn’t stain so easily AND washes well when it actually is stained. Seems like the performance fabrics covers the stain part but doesn’t wash well while the cotton ones is the opposite. Would you say the “Perennial Performance” has got the best of both worlds? Yes, that’s what I have. And I love it! 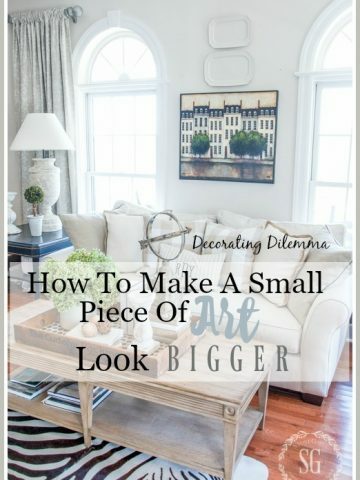 I’m currently in the process of buying all new furniture for my living room, and your tip for measuring the room and sofa will probably save me lots of time! I never thought about doing a slipcover for my sofa, but what type of fabric would you recommend for a slipcover of a sofa in my living room? 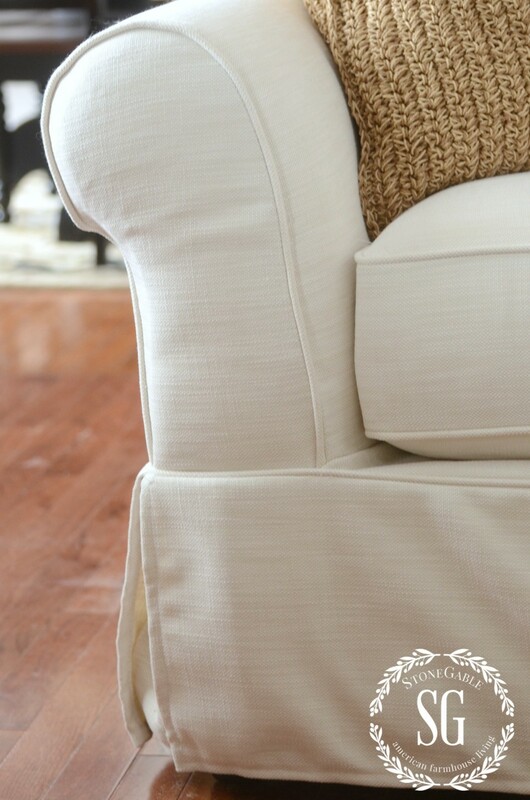 I’d have a slipcover custom made with fabric that does not stain easily and can be washed. Awesome, thanks for the tip. I will see what I can do. thanks for the great post! Hi There, I am looking at purchasing the grand sofa from pottery barn. Can you tell me if you got the down filled…. and if it has become lumpy or if it still comfy. I have plenty of room in my great room for two grand sofas, would you go with that combination??? I prefer a down filled sofa. It’s not lumpy at all. It is amazing! About two years ago, in need of a sofa quick, I bought one from a friends mom who had just relocated to our area. The sofa, love and chair were covered in a crazy pattern and i knew I wouldnt be happy with it, but I’m a crafter and I also knew it was my chance to paint fabric! I did, and I love it!, but alas a 4 year old nephew has destroyed the cushions when he stayed here for a month and I am in the market for a new sofa! Guess what came in the mail today? The new PB catalog! I am so grateful for the chance to learn to chalk paint this set, and to pass it down to a family member soon, but I am buying the PB sofa after the first of the year! Thank you so much for this post, I will take all info and suggestions and run with them! Yvonne, your rooms are beautiful!!! Hi. Do you have suggestions for sleeper sofas that are both comfortable to sleep on and sit on for everyday use in a family room? Kathy, I can’t help you in that department. I don’t have a sleeper sofa. Look at reviews!!!! And make sure to see the sleeper sofa and try it out. I bought my sofa several months ago. I was worried because it was my first purchase online and the sofa was expensive. But i got exactly what i want and, I am happy. We’ve been looking at the PB Carlisle grand sofa and the Restoration Hardware Maxwell sofa with Belgian Linen. Our concern is with the Restoration Hardware sofa, quality and the linen fabric. How it holds up to spills and how the down cushions hold up, if they flatten too quickly. Wanted your advice on both. I know nothing about he RH Maxwell sofa. Sorry! Good read! I bought leather sofa set for my living room from Surplus Furniture warehouse for $ 868 an year back and I should say I don’t regret it now 🙂 Good that I dint choose the very expensive ones!!!! Good guide! I think good sofa starts from $500, but $5000 is too much for the furniture. Who knows, mabe it depends on the manufacturer. They are holding up great. However, I would get the 3 seat sofa if I did it again! When is the annual sofa sale? I would love to save 30%! I’m not sure Aunt B… you will have to keep your eye open for the sale. Hello! I am planning on purchasing a PB Comfort sofa and contemplating between the Perennials Performance in Ivory or the Performance Canvas in White. I like the durability of the Perennials fabric but worried it might look too yellow (according to the fabric swatch sample) as I’ve always wanted a white sofa. Looking at your photos, the Perennials fabric looks quite white but I’m not sure if it’s because of the lighting. Can you please comment on how the color looks when you see it under natural lighting? Does it look as white as the pictures or is it sort of yellowish? Thank you! Hi Jasmine, if you want a true bright white don’t go with the Ivory. It does have an ivory cast, but it really is quite neutral. But it is not bright white. Thanks for the tips! I need to buy a new sofa for the living room in my new house. Your tip for measuring my room and for the sofa that I want to buy will help me save a lot of time and money. I don’t want to buy a sofa that’s too large for my living room. If I measure the sofa that I want to buy, then I should be able to take it home without any problems getting it to fit in my living room. great tips! Just one month to late for me!:-(. I looked and looked and researched and had a designer from a furniture store come to the house. I purchased a beautiful Smith Bros. Off white tufted back, three cushion, nail studded, low arm sofa. Probably. Thought about going back to the store and asking to return it. Such a hassle !! I get tons of compliments on it and it’s quality and made in America . I had a two over two cushion slip covered sofa from Rowe. It was so comfy. I wanted something dressier. Any advice about what to do ? Should I presue a return and possibly lose money on the restocking fee or just hope it softend up over time! Buying a sofa is so hard!!! Hi, Do you mind me asking which “Performance” fabric you purchased? Is it the basket weave? It’s really beautiful. Hi April, yes the fabric is performance in ivory. It’s holding up wonderfully! Our home is often like a hotel… filled with guest and it gets used hard! Thank you for the great tips on buying a sofa. Though I am not ready to buy a new just yet, this info. will be helpful when I do. This last sofa was a love seat because my living room is small, I was looking at PB sofas and of course I fell in love with their comfy sofa. Did I buy it no, and now even before I read this post I wish had purchased from PB, as I also have a crush on PB . I love reading your blog , I feel like I have a new friend ,and with all the ladies that post on here, I can relate to all the post in some ways. Wonderful tips! Cost is especially something we tell customers to focus on here in the UK, a good budget is something every furniture retailer will try to work around but without it, things can get very confusing, very quickly! Thanks for the great tips for buying a sofa . I’m a sofa shopping, and your tips are awesome. We are looking at couches, I have been thinking about leather. I have 4 children and our couch would have very heavy usage. What are people’s two cents on leather? Hi Christaina, you certainly need a sofa that will work hard for you! Personally, I’m not a fan of leather sofas. Although they last forever, they are usually dark and often show their wear. I also don’t find them very comfortable. Leather is cold in the winter and sticks to the back of one’s legs if you wear shorts. I am such a fan of natural colored slipcovered sofas. They can be washed and washed and come out clean. And new slipcovers can easily be made for them. A sofa is the biggest piece of furniture you will buy, you want something that wears and is attractive. That’s my two cents. Hope this helps. Yvonne…thank you so much for all the info you have given us. We have been needing to purchase a new sofa for several years and just have not been able to make up our minds. I am also wondering just like Linda, two or three cushions on the bottom? Could you please share your thoughts on that? I think that is what we have been struggling with. Any help would be appreciated. Your blog is a joy to follow and the ideas are wonderful. Thanks for the time and effort you put into it. Hi Sandi! Some of the time the cushions are determined by the size of the sofa. A smaller sofa usually will have 2 cushions and a 3 cushion sofa is usually a longer one. Hope this helps! Great advice. It also depends on the area we have to fit a sofa into! We have a 2 cushion sofa and I know what you mean. This was soooo great for me, my sofa are dying! Thanks for the great tips, pinned! If you need to get rid of it, do it! Sometimes we hang on to a sofa because we paid so much for it. Forget about it! Find someone who needs it and give the darn thing away. Caution: If you hate fussing with your sofa every day DO NOT buy one with loose cushion backs. They’re maddening. If you want your cushion to wear evening, be sure they’re interchangeable meaning you can change their position with any other seat cushion to the sofa. Some cushions are not square or rectangular but sculpted to fit around the arms of the sofa. On cushions with a box edge, the box edge trim wears faster than one with knife edge, however, they tend to keep their shape better. If you have pets or small children, consider a fabric that contains Olefin. It’s make clean-up a breeze. Make sure that when sitting on the sofa comfortably, that both of your feet can rest flat on the floor. If not, you’re going to be uncomfortable when sitting for long periods of time. Don’t make a decision to purchase a sofa because it comes with cute throw pillows. Throw pillows are cheap and you can change them out easily. What a wonderful read!! I’m also sofa shopping, and the above info is priceless. Yvonne, I am such a fan! Love, love the way you put together your rooms. I admit to studying every little bit of each room I can see on your blog. Thanks so much for sharing your home with us. I truly never tire of looking here!! Oh my goodness, thanks Debra! LOVE my readers like you! onstantly switching my sofas around! Fortunately, I sew fairly well and have recovered a few over the years. I’ve often bought vintage because they’re almost always well-made and I know I can re do it, but I know that’s not for everyone. I’d love to see a pic of the “18th century cotton” fabric. I just can’t picture that. Fabulous tips my friend!! This sofa looks amazing in your room! Love the white and slipcovers are so covenient! Great post!! I was just wondering if you or anyone else might know of a good sofa sleeper? Let’s help DG… do you have a great sofa sleeper sofa? Yvonne, I see you mentioned your PB fabric is Perrenial Performance in ivory…can you share what type of fabric? Denim, linen, a basketweave? Your photos are gorgeous, but I am not sure just what the exact fabric might be? Thanks and as all the women above have said….I absolutely LOVE your blog, very helpful, wonderful ideas and just beautiful photography! Hi Yavonne, This is the first time I’ve sen your web-site. I got here through “on Sutton Place” blog. First let me say I already love your site! I rarely ever write to sites but because I sold furniture for many years, I have lots of additional info for sofa buying .PLEASE READ THIS IF YOU ARE BUYING A SOFA! *Don’t buy loveseats for a combo loveseat/sofa room. Loveseats are OUT and are very impractical. They also cost almost the exact amount as a sofa. So if your family are sitters buy one sofa and a couple of chairs. If you family likes to lay around a lot and you have room ALWAYS buy two sofas. Many customers thanked me for this advice. *Most ready made sofas now days have ATTACHED back pillows. This means the back cushions look like they are loose but are actually attached about six inches down to the back. Not to be confused with a TIGHT back sofa which does not look like a loose pillow but the fabric is tightly attached to the very top of the sofa. NEVER BUY a ATTACHED back sofa if you have small pets and rambunctious kids. Pets love to lay in the space that is created in attached back cushions and even in the best made sofas this will rip,rip,rip! Salespeople will tell you that an ATTACHED back cushion always stays in place and always looks neat. In fact this has become a popular myth. These are made to save manufacturers money because they use less fabric and are easier to upholster. *Remember you may have to straighten out a loose back cushion more often buy you can fluff them up to look fresh and you can reverse them and move them around the sofa to keep wear at a minimum.
.*I agree with you Yavonne, that unless you have tons of money buy a decent sofa that will last you ten years at most. Because re-upholstering is so expensive, you’re better off replacing a tired sofa than buying high end, thinking you’ll re-upholster it someday. The math is against you. *Ask,ask,ask about fabric content and cleaning. I’ve seen people buy a new couch and a child runs in with a damp swimsuit and the sofa is ruined! If the salesperson doesn’t have good knowledge of the fabric, don’t buy it. *About price. If you need a couple of accent chairs to make a rarely used room look nice, go ahead and buy a lower price bargain at Target or Homegoods. But these chairs are for looking cute and not for everyday living. They usually have plastic frames and will not last. If you really want a leather sectional with reclining seats you can not buy a low price item! I had one customer a few years ago who came in looking for a new sectional because the one he bought just TWO years earlier at a low price furniture store had completely fallen apart and the warranty was up! He paid two thousand dollars of HIS HARD EARNED money and now had nothing. If you are looking for something like this you have to know you will need to spend a lot of money. The sectional this man wanted should easily have cost two to three times what he paid. Sorry this is so long but its a passion of mine that people get what they need with their hard earned money. If anyone has any other questions, I will be happy to try and help. Oh my goodness! Welcome to the StoneGable family Meg! Thanks so much for your wonderful advice!!! What a sofa reference you are! What a great post Yvonne!! We bought a Pottery Barn sectional for our family room last year we bought the “Cameron” We love it! Before we ordered it we went to PB and tried out a bunch of different styles so we would be sure we liked it…your right comfort is soooooo important! Yvonne, thank you sooo much for the tips on purchasing sofas. You are exactly correct in the number of years to tire of one. I made the mistake of purchasing a well-made sofa 7 years ago, with a “Floridian” flower pattern, since I had moved here from up north. Will be watching for sales now and have a better idea as to what to buy this time. I enjoy your blog, too! Thanks for the lovely comment Linda! Love your sofa, looks a lot like mine. After seeing the comments about Ethan Allen, I have to join in. I have four oak dining chairs, I bought 39 years ago to go with my grandmother’s oak table and we still have them. They’ve survived many military moves, two of them to Germany. Love Pottery Barn too! I know Brenda! We love Ethan Allen here at StoneGable! Such great quality!!! So glad you joined in the conversation! This is so helpful, especially the tips about sturdy construction and the cushion fillers. We will be in the market for a new sofa within the next 2 years. 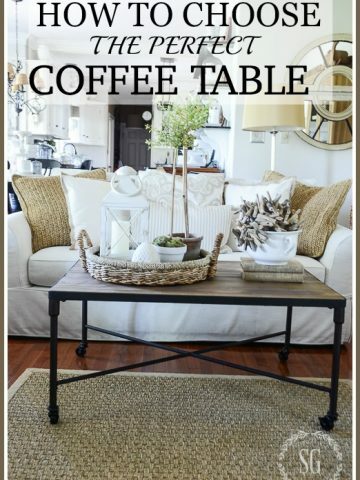 Right now I am searching for the perfect coffee table and I love the one in your pictures. Is this a pottery barn find also? Great tips, and very timely for me, as we will be buying a new couch for our in-law suite soon. I too bought a high quality, expensive, custom sofa I was sure I would love forever, and I did love it for many years. 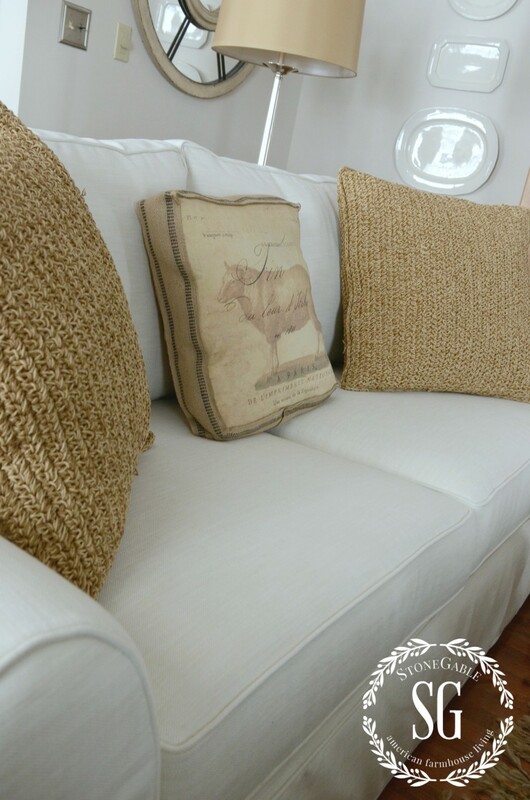 When I wanted, but couldn’t justify spending money on, something new, I made custom slipcovers that changed my dark tapestry sofa into a light cream-colored dream. Best of all, I can throw them in the washer when they need to be freshened up. 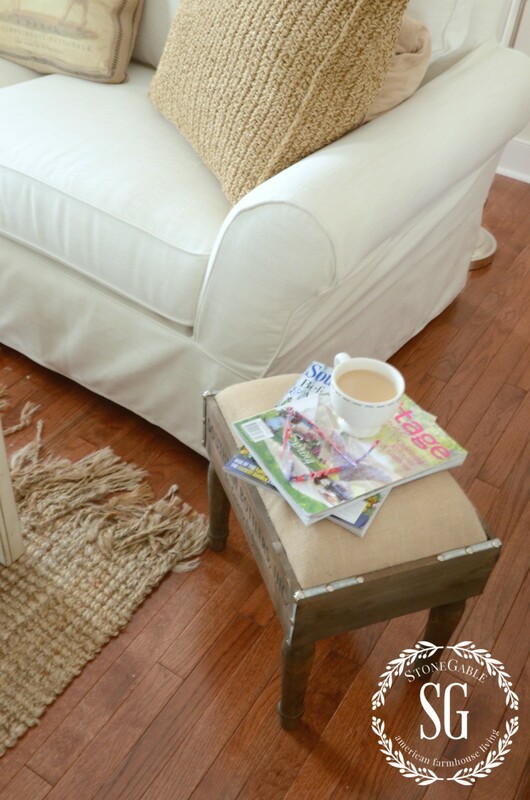 If you have a piece that fits your space, but not your taste, a slipcover can be a great solution. I purchased a Rowe sofa over 20 years ago. It was a small apartment size, 72 inches with a thin cotton fabric. After 16 years the fabric finally wore out but the sofa was in perfect condition. The cushions were as comfy as the day I purchased the sofa and it took a beating. When it was time to purchase another sofa I did my homework. I wanted something that would last but I did not want to spend too much money. In the end, because I was so pleased with how my old sofa held up I bought another Rowe sofa with slip covers on sale for $1300. It has been five years and the sofa looks and feels as it did the day I purchased it. This sofa sits deep for me as I am short but I dont mind as I usually “lounge” on the sofa reading my books and blogs and end up falling asleep for a couple of hours. before going to bed. A year ago I purchased another Rowe sofa for my family room with Sunbrella fabric. I knew it was 100% polyester so I was concerned about pilling. I was assured it would not, so far so good. I could not be happier with this brand for the price. Yvonne, I looked all over for a pet and kid friendly sofa. I looked at Pottery Barn as well as Ballard for one with slip covers which could be replaced with relative ease and expense. The best I found was the Beachside (Cindy Crawford) at Roons to Go. I paid about $700.00 for a white canvas . I also bought a blue denim set for about $225.00. The sofa is going on 4 years old now and it has held up great. The slips wash well and are cheap to replace if needed. Best value around. I enjoy your blog daily! I gave an off white twill Pottery Barn Basic sofa with down-wrapped cushions. I have washed the slipcovers dozens of times over the 15 years I have had it. It is comfortable and still stylish. Goes with every decor. . Love it and would buy the same exact sofa again. Hi Mayanna I wonder how easy it was to stain the twill slipcover? do you have small kids or pets? Was it hard to put the slipcovers back on the sofa? I’m debating whether to go with the performance fabrics Vs Twill/Canvas. Looks like the latter would wash better and more durable, but I have a baby at home and worry that the cotton ones would stain too easily. Thank you! Thanks for answering that question, Mayanna. My reader’s are the best!!! Thanks Yvonne those were great tips, do not need one yet but sure i will in the future. Yes, this came at great time for me too! I have looked at PB sofas and love the Cameron. Would love to hear what you think about one. Also, don’t really get the slipcover idea. I understand you can wash it, but after I pay lots of money for a sofa don’t think I would want to cover it up. Does the slipcover match the color of your sofa ? Just wondering in case I change my mind. Love your blog, always have great ideas and advice !!! I am curious is you tried the Cameron. I am looking at it also but am wondering if it is too firm? I have the Cameron sofa and love seat in my living room and love them! They sit higher (I hate sofas that are too low…at 68 I’m not graceful anymore) and are super comfortable. I would choose them again. No, I have not heard of Cameron. Going to look it up! Have a great Ethan Allen couch (remember the bear on the couch) would love a slipcover for it …just tried of the green…are their any good on line companies that do this? Great article. This is a great article on buying a sofa. I just purchased a new one last year and put a lot of thought and effort into it. I love it except for one thing. I got the HR wrapped in down and the cushions always look a little messy. The cording around the edges don’t seem to stay in place with the cushion. I knew with getting down wrapped they probably wouldn’t look as crisp as a regular foam cushion but didn’t know it would be this bad. Any advice. I have made a few sofa blunders too! I totally agree about the rolled arm. I think lifestyle has a lot to do with what you select. I like to take a nap on the couch, so the slip covers are not a good choice for me. I went that way once! Hated having to constantly smooth and adjust, and yes, I had them professionally made. Another thing, I don’t want loose pillows, as they always have to be fluffed. I am short, so I don’t want one where my legs dangle, yet it has to be deep enough to be comfortable. Like you said it has to be higher off the floor too! I had a clayton marcus sofa reupholstered in a lovely toile fabric, but it was more costly than buying a new sofa! Now I think I will move that to the living room and get 2 new sofas for the den. My son has 5 kids, so when they are here I need comfy seating for 9. Unfortunately, due to doors and fireplace a sectional won’t work. Thank you for this post. I have been looking for a sofa for months now and scared to buy because of past mistakes. I keep wondering what lesson I have yet to learn! I feel like I can go buy a sofa with confidence now that I have your knowledge and wisdom. ( : BTW – I start every morning by reading your blog. It is so classy and yet down to earth. You are head and shoulders above other blogs. Keep up the good work!!! You are so so dear Kathy! go and get that wonderful sofa! what a fantastic overview which is sure to save folks time and worry. i think lots of people freak out because the message everywhere is: be careful when selecting a sofa…you’ll have it for a while, etc. my most recent sofa is a restoration hardware belgian beauty (a couple yrs ago) and is almost TOO comfy as my adult sons want to sleep on it when they are here! the belgian linen has been the easiest fabric i have ever lived with. i can scrub it, and everything including red wine comes clean. peace to you, sofa queen (which is nothing at all like a couch potato!). have you ever washed your Restoration Hardware Belgian linen slipcovers in the machine and did they shrink? I have the RH Belgian linen slipcovered classic roll arm sofa and I want to wash it but I don’t want it to shrink. The tag on it says to hand wash in cold and lay flat to dry. Have you ever washed yours before and how did it come out? Hi Danyelle, My sofa is not from Restoration Hardware. You should call the company about this issue. I hope they can help you! Like the rest, this came at a perfect time. I am actually working with a Pottery Barn Design Specialist – via email. I have a very odd shaped, small, family room and am having a really hard time finding something that will work in that room. I have a very bulky couch and chair that are overwhelming the room – bought before buying this house. She has had me sending her pictures and dimensions of the room. Hopefully she can come up with something that will look great in the room. Thanks for this article! My lesson (to date) is…I will never buy another tufted sofa. Three buttons on the bottom cushion has broke off and are now in a baggie waiting for me to get the nerve to take the near 6ft cushion to the upholsterer. The baggie has been hanging on the frig for close to 3 yrs……I just know as soon as I get these buttons connected to the cushion another button will break off. This post could not have come at a better time. We have made so many bad sofa purchases that I was ready to ban myself from sofa shopping. We made our last purchase from a populare store similar to Pottery Barn and it has not lasted at all. Let’s just say that microfiber did not hold up to claims and is horrible to clean. The cushions have softened into a back breaking pancake. It was not inexpensive. Our one good sofa is a Mitchell Gold leather piece and is lasting like iron. It’s very dog friendly and will go to one of our kids when we tire of it. The style is no longer available and I don’t want a family room sofa that will last that long. All great tips Yvonne! You are so right about the 7 year buying time. That is exactly what I have come to terms with over the years. The sofa is the one piece of furniture we have purchased more than any other. My next sofa will be a slip covered PB sofa, good quality and a great price point too. Your sofa looks great in your room!! Smart purchase! I am not familiar with that brand! Sorry! Maybe another StoneGable reader is and will comment. Come on readers… let’s help Paola! Yvonne-thanks so much for your post today! I have been looking at sofas for months now–and I am so afraid of making a mistake! I too have bought patterned sofas in the past but this time, I want to go with the slipcovers and have been watching the PB sofas. I think they were on sale last week…next time I see them I am going to just jump on it. I am looking for all the same things that you were looking for–so I am going to take your advice. You really can wash the slipcover, dry it, and put it back on?! I also want a higher sofa and one that is deep enough to curl up on. Would you say that is true about this sofa? Your room looks great! I want a natural rug like yours too. This is a very comfortable sofa. They do have a “grand sofa” that is 2 inches deeper. Boy, you would think Pottery Barn was paying me for all the advertising I am giving them today! ha-ha! Love your sofa, Yvonne. I have the PB basic in the sun room and have had it at least 12 years. It came with the white denim cover and it eventually wore out a year ago. I went to the store to buy a new slip and wish I had gotten the same one. I bought the performance canvas one and hate it!! The problem is it is 100% polyester and it is pilling just like polyester clothes do. A $800 mistake! I hope yours wears well. We also have the PB Comfort sofa in performance canvas, and we just talked to customer service today about the pilling! We were told the same thing as Kelly above – take photos and e-mail them. Good to know that the sunbrella fabric also pilled because that was going to be my second choice. Back to the drawing board. I’ll look into the brushed canvas! I’m been finding out that that is a common problem. Too bad, I love this sofa! We had the same problem with our PB slip cover in Performance tweed, AND performance canvas! They both started pilling within a month! Fortunately Pottery Barn customer service is amazing and they have sent us 2 new ones! Now we have the brushed canvas and it is wearing VERY well. Better with time!! I had this exact same experience. Had an older model with the regular twill cover, loved it, and thought I would “upgrade” to the Performance Canvas. It’s been less that a year and it has pilled. I’m so disappointed. We noticed right away that every bit of dust/lint/hair/fiber, what- have- you , seemed to “stick” to the finish. Yes, it washed up beautifully but doesn’t stay that way long at all…and now the surface is all rough with pilling. Wrote to PB and they offered 20% off on a replacement – NOT happening, are you kidding???? Hi Betsy, Canvas is usually made of cotton and cotton will pill. That’s why I bought a blend fabric and stayed away from cotton. Make sure you contact Pottery Barn, I thnk they have some type of guarantee on their Performance fabrics. And they should make any defective sofa right. Thank you for your great insight on Pottery Barn couches. I made an investment in two PB comfort grand couches and received them September 2015. We selected the Sunbrella Performance Boss Tweed fabric in Pebble (herringbone look in a cream/gray neutral color, its 100% acrylic) because well, we though they would “perform.” Within one month both couches were pilling and looking fuzzy. I called to the PB designer I worked with and submitted photos and she helped to escalate my order to work on replacements. I’m now doing homework on ALL of their fabric so we make the right choice for replacement but I don’t have confidence based on everyone’s reviews. We like cool neutrals but I’m very nervous about picking white couches. I’m focused on the Performance Tweed (Grade E) fabric, and a new Performance Linen that just came out. I called to find out the blend on the Performance Linen and its 51% rayon, 22% linen, 16% poly, and 11% cotton. Is that good or bad? I ordered the three swatches from the site and I’m waiting now. The PB reps at my local store all love the Washed Linen Cotton, three have told me to pick that but its not performance, and we have a small dog. Also, sad to hear that the performance canvas isn’t reliable! Any insight on the two replacement fabrics I’m looking into would be greatly appreciated or any other guidance for that matter! I also have the option to jump ship and pick a completely new couch in leather, that my be something to consider if everyone is still having issues. HI LAUREN! I have the perennial performance basketweave grade E and it is fabulous! It as not pilled and we use it a lot every day!We chose the ivory slipcovers. I’ve had it for a year and have not had to clean the slipcovers yet. All I do is spot clean according to directions. You might want to look into that fabric. It’s a winner! We bought both of our kids PB Comfort sofas for Christmas last year (not my fabric) and the pilled. They said it was a bad batch of material and replaced their sofas. Hope this helps. I have a PB comfort sofa in Performance canvas and it pulled within 3 months. Called PB, sent pics and haven’t heard a word from them since. I’m curious as to how you got PB to respond. Keep on them. Both of my kids had the same thing happen to them and they got a new sofa. I think it was a bad batch of fabric. No. It’s a ivory woven performance fabric. Not canvas. Canvas is usually cotton and it might pill. Mine is the Perennial Performance. You bet I’ll be calling someone if it does not hold up! So far… so good! I am looking at Pottety Barns website and I do not see fabric listed as Perennial Performance. Do you know if it might have another name other then that? Thank you. Look for the color “flax”. Can you tell me if the slipcovers shrink at all? Love your blog! Mine never did. But it was red and after a many, many washes (lotsa dogs), it did fade. Was a great sofa. I don’t know yet, because I did not wash it. But this “performance fabric” slipcover was made not to shrink. Hope this helps! both sides so that they can be reversed for even wear. It never occurred to me that they would not be! I have never heard of a sofa cushion only being upholstered on one side. Wow! So glad you told us about this. Thanks bunches for a great tip! I have bought 4 sofas or couches in the 43 years of marriage. First one last 25 years and was not used much, the leather one we have I hate, but hubby loves it,( go figure), and the sleeper I would never buy again! I just said yesterday to a co-worker I would love all new furniture in every room, just a fresh start from when I first bought furniture till now my tastes have changed!! I have made so many mistakes with sofas. One I bought was delivered when I was not at home. One look at it and I thought they had delivered the wrong sofa. Lived with the Blue Monster for a few years & then donated it to a friend. I like the one I have now,but not truely love it. Will check out the PB sofa. Thanks for the tips. Your new sofa is beautiful, Yvonne! Thank you for all of the tips! What size sofas are in your living and family rooms? Do you mind telling me when the PB annual sale was? We need two new sofas in the next year, and I’d like to wait for that 30 percent off sale. We ordered our sofa in January. Look for sales they have them once in a while! Hope this helps, Lori! Great post. I too learned the hard way, an expensive piece of furniture will ugly out before it wears out!!! LOVE that Peggy! Great phrase… ugly out! Can I use that? Very timely post for me… I’m just looking at buying the PB comfort sofa! I was planning on the down option – does that come with the HR fill? I also wasn’t sure about the roll arm – thought I might get away from that this time – but your point about resting your head is a great one. Also wasn’t necessarily thinking of the performance fabric, but may need to consider that. I’m looking at the sectional, so it adds a lot. That is a great point, Lory! Have fun shopping! Your post came just in time Yvonne! . My leather sectional is going on 12 years., so it’s time for a new sofa. My favorite furniture store in Florida is Indian River. They have all the name brands and the sales people are very knowledgeable. This Saturday they are having a one day sale on everything in the store. They do this twice a year and with a complementary breakfast buffet! Thank you for all those wonderful tips! I’m going to jot them down and take them with me. Have a great weekend! Have fun sofa shopping Nancie!!!! So fun! That’s very sad…and expensive, Mary! I’d call the company… and be politely persistent! Doesn’t work with them. =( We tried numerous times. I sure wish that we had seen your post back then, sounds like PB would has Great couches & you’re definitely not the only one that thinks so. We bought a new sofa LAST NIGHT!! Wish I’d seen the tips beforehand. But I think I’ve followed most of them anyways. We chose a sturdy linen ivory fabric with a tufted back (perfect for my very traditional style), custom made with carved legs to match the French Bergere chairs in the room. It replaces my “divorce” couch – bought the day my ex and I parted ways and I needed something for my new apartment – hated it from the day I got it home for it’s pinky/beige tone. And the “ultra suede” fabric just wasn’t wearing well after 11 years of use. These are great tips…but I happened to notice something new in your kitchen. I know you didn’t like the tile work that was done above your stove. I see something I haven’t seen before! I hope I didn’t miss your blog about that, I like to read your blog every morning with my coffee! It makes me happy. You have a good eye! No, I have not shared it yet on the blog. I’m not quite finished with it yet.. I put a chalkboard there! I love it! But am still trying to figure out how to print something on it and be able to wipe off any splatters. I have a chalkboard above my stove too. I’m looking forward to your blog about it! My new PB Comfort sofa is being delivered next week. Can’t wait! I just updated my 10 year old PB Charleston sofa (upstairs den) with a new slipcover. Looks like a new sofa! Thanks for your tips. Beautiful, beautiful Yvonne….you cannot go wrong with Pottery Barn…so comfy and classic. I was tempted to buy one when they had their great sale…but restrained……Have a wonderful weekend!…Stay warm and safe! LOL – Hard to believe – ” 23 years with 18 century yellow floral brushed cotton sofas” – we must have had the same sofa. Mine was my first venture into decorating my living room after college and I had my first real job. I do believe you won though as mine finally left after about 15 years. When I buy furniture now and they begin to tell me how long it will last I just shake my head – I don’t want it that long. I thought I’d leave a note about the Ethan Allen “Bennett” sofa which we bought at the recent Presidents’ Day sale. It has all the attributes you mentioned and should be a family favorite as soon as it arrives in May. One thing I was impressed by was that the seat cushion was firm and the back cushion is soft and supportive — heaven. Our last couch purchase, also an Ethan Allen, has lasted 20 years and is going strong! My main tip is to pick a SOLID COLOR and not a print — prints look out of fashion in no time! You can always accessorize a solid sofa! We just purchased the Bennett track arm sofa at their 25 % off two items sale and and can hardly wait for it to arrive . We got the comfort whatever style in a reede/wheat polyester fabric which is just beautiful and soft . Debated about semi attached pillows vs not attached and decided on semi attached so the pillows will always look in place and won’t require pumping them up . Getting lazy in my old age . I don’t think you could go wrong with this sofa . Enjoy your purchase . Love to hear what you think of it when you get it . I am currently looking into buying the Bennett sofa from Ethan Allen. They cost a bit more then what I’m use to spending. Would you say the cousions keep their shape? What color do you have? I’m debating on slate or oatmeal. I love Ethan Allen but have not owned an Ethan Allen sofa in over 25 years. Sorry I don’t think I can comment on their sofas today. I love Ethan Allen too! Their sofas are VERY WELL MADE! ANd yes, thanks for the tips about getting a solid color. I think you are sooooo right! Then you can decorate it with all those wonderful pillows! Thank you for your wonderful tips. I’ve been eyeing the Pottery Barn sofas for some time now. We are in the market for a new sofa — the one we have now noone wants. It is very dated, Mediterranean style, lots of visible oak and sooooo uncomfortable. It is 36 years old and looks like new. You are so right about not getting something that lasts longer than your youngest child. You mentioned your new sofa is slip covered. What is the fabric that covers the actual sofa? Hi Marisa, You comment about not getting a sofa that will last longer than your youngest child at home gave my a good laugh! And so so true!! The slipcover fabric on my sofa is “Perennial Performance” in Ivory!